In the midst of filming and photographing juvenile fish in a lagoon, the filmmaker literally ran right into two speared octopi trailing behind a young Hawaiian spear fisher. When asked how she could possibly eat such beautiful, intelligent animals, the fisher freed one of her proud “catches” for the camera, speaking to the he’e’s playfulness, until she was wrapped in tentacles, sprayed with ink and unable to reconcile her relationship with the being destined to be taco (food). He’e Taco (octopus octopus) is as disturbing, and ambiguous as the moment it captures. The video raises a number of ethical questions regarding the artist’s involvement and obligation, as well as the camera’s role in a disruptive, inconclusive narrative. Karolle Wall is a videographer, photographer and writer whose work reflects her passion for marine biology, environmental ethics, indigenous ecological knowledge and water. 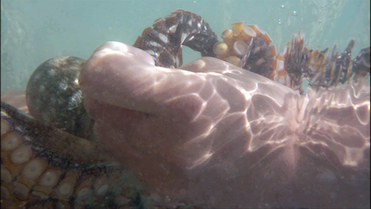 The unlikely mollusk, be it a ½ inch nudibranch (sea slug), eighteen inch moon snail, or two foot long octopus, features prominently in her films, drawing attention to our ever increasing need to value patience, caution, and primary observation as significant forms of interacting with the non-human world. 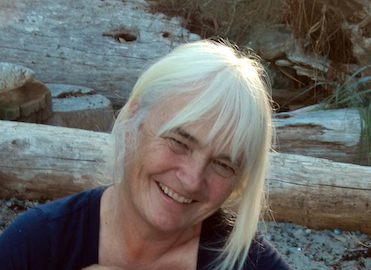 Karolle recently retired from her position as Associate Professor in Critical + Cultural Studies at Emily Carr University, where she taught courses in writing, literature, film, rhetoric, and environmental ethics. She currently divides her time between Galiano Island, British Columbia and Maui, Hawaii. If conditions allow, she spends several hours a day on or in the ocean, camera and patience in hand, observing and recording individual behavior and interspecies relationships. Her work has been shown in galleries, film festivals and conferences throughout Canada and the US.